The Rate-Of-Flow works by means of a flow sensing paddle in the flow on the upstream side of the valve. It is a significant advancement in accuracy because it works independent of line pressure responding only to the flow velocity impinging upon the sensing paddle. This Rate-Of-Flow control is an option which can be combined with most other pressure and electric controls used on the 800 Series valve. The main application for Rate-Of-Flow is during system fill to avoid unwanted water hammer or surges which can damage system pipes. The Nelson Rate-Of-Flow control has been designed for efficiency and causes insignificant pressure loss. The control has a calibrated adjustment screw for simple setting and can work over a wide range of flow rate. 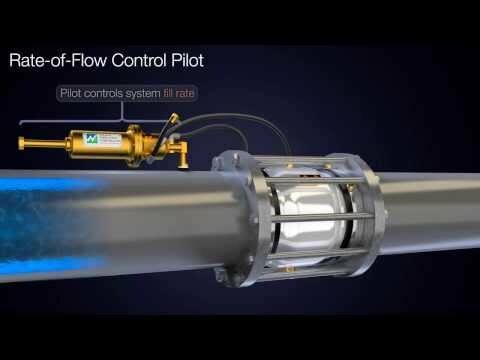 The Rate-Of-Flow Control is designed to fit into the valve but can optionally be located in an adjacent upstream section of pipe. Maintain stable hydraulic conditions with Nelson 800 Series Control Valves. The only calibrated pressure control available in the industry. Convenient for setting correct flow and for quickly checking proper flow ranges. Low friction spool works without any pressure drop. This feature can stop wild pressure swings and tune the valve for needed accuracy. The Nelson ACV200 Air Control Valve is outstanding for controlling air in irrigation systems. The ACV provides all three types of air relief: air relief, vacuum air relief, and continuous air release under pressure. 4” Valve x 6” ANSI Flange and 6” Valve x 8” ANSI Flange Kits are available. Click here for lit. sheet.